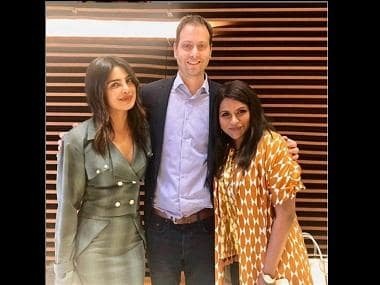 Quantico star Priyanka Chopra walked the red carpet at the 69th Primetime Emmy Awards and once again, the actor knocked it out of the park. Looking sleek in a figure hugging, white Balmain gown, the actor made for a breathtaking vision as she glided down the red carpet. Actor Priyanka Chopra attends the 69th Annual Primetime Emmy Awards. Image from Getty Images. Priyanka Chopra stuns in a custom-made figure hugging, white Balmain creation. Image from Getty Images. Last year the actor wore a crimson red Jason Wu dress that had everyone sit up and take notice of the Indian star (it could also be her super dramatic twirl on the red carpet which was hard to miss). Priyanka Chopra twirls on the red carpet at the Emmy Awards 2016. Image from Getty Images. This year too, Chopra's look is being hailed as one of the best looks of the night. 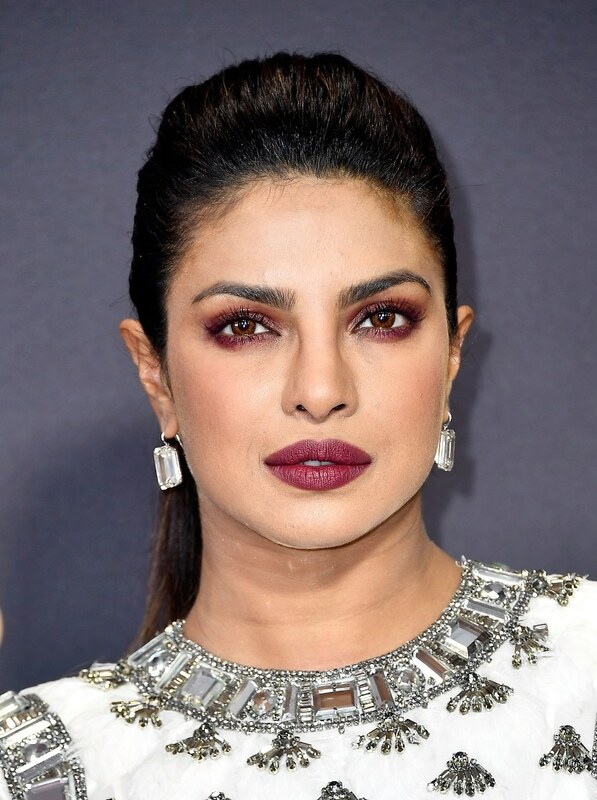 Priyanka Chopra's fierce make-up, sporting berry lips and eyes. Image from Getty Images. Chopra wore a custom-made white Balmain ensemble that flowed and cinched in all the right places. A long feather train completed the dramatic look. Quantico star Priyanka Chopra at the Emmys 2017. The subtlety with which Balmain's creations take something that has the potential to be over the top (read: extraaa) yet giving us a final ensemble that is understated and classy is the sign of a finessed designer. The 2017 Emmy Awards were held at the Microsoft Theater. Image from Getty Images. Chopra's gown was embellished with sequins in a pattern that looked surprisingly inspired by an Indian motif. A chunky hemline at the neck and armholes gave Chopra's outfit the exact amount of attention it deserved. Priyanka Chopra on the red carpet of the 69th Primetime Emmy Awards. Image from Getty Images. Chopra presented an Emmy Award for the second time as she gave John Oliver the Emmy for Outstanding Variety Talk Series for his popular show Last Week Tonight with John Oliver. 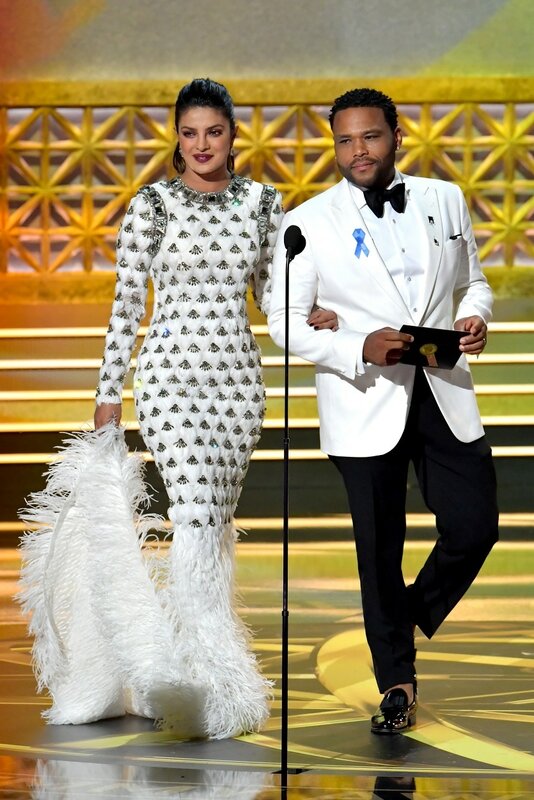 Priyanka Chopra and Anthony Anderson presenting an Emmy award. Image from Getty Images. In 2016 Chopra had presented the Emmy to The Night Manager director Susanne Bier for Outstanding Directing for a Limited Series, Movie, or Dramatic Special, alongside co-presenter Tom Hiddleston. The actor has previously presented awards at other prestigious ceremonies like the Golden Globes and the Academy Awards. Priyanka Chopra and Tom Hiddleston at the 68th Primetime Emmy Awards. Image from Getty Images. Even the Twitterati came out in support of Priyanka Chopra's style as the actor slayed the red carpet.